In a big move Mount Saint Mary's grabs up Butler Bulldog transfer Andrew Smeathers. Smeathers is a 6'6'' Small Forward with a prolific 3-point shot, he will thrive in the Mount Mayhem style. Andrew will be enrolled at Mount Saint Mary's Jan. 2014 and will be eligible to play beginning Jan. 2015 with 2 years of eligibilty. With the 2013-2014 Men's Hoop Season ready to kick-off, with official practices starting on September 27th we have complied our Northeast Conference Predictions. This conference looks to be wide open with many returning starters top to bottom. First Year Head Coach Greg Herenda of Fairleigh Dickinson University Knights, looks to bring the University back to the top as well as Sacred Heart University First Year Head Coach Anthony Latina. These predictions are Recruit Recon Only Predictions. Mount Fan Blog: Mo Sallah, a 6-8 forward from Broadfording Christian Academy in Hagerstown, has pledged his future to Mt. St. Mary's. Sallah led BCA in scoring a season ago averaging 18.4 per night. In addition, he grabbed 14 rebounds per night, and blocked better than 3 shots per contest. The Lions lost in the championship game of the Mason Dixon Christian Conference. Sallah had 20 points in the championship game. He was named to the MDCC All-Star team, and the WHAG-TV 25 Fab Five team. Sallah is spending a post-graduate year at Fishburne Military Academy in Waynesboro Virginia and will join the Mount in 2014-15. Sallah will spend most of his time in the low block for the Mount. At 6-8 and athletic he should fit in well with the other 4 who already committed as part of next year's class. The Mount has landed point guard Junior Robinson, and front line players Chris Manning, Chuck Wray, Troy Henderson and now Sallah. NERR: Sacred Heart landed a big commitment on Tuesday afternoon from East Hartford native and St. Thomas More guard Cane Broome. First year Sacred Heart head coach Anthony Latina made Broome his top priority this summer and followed him throughout the month as he and his Expressions Elite squad traveled from the Nike Peach Jam to Philadelphia to Atlantic City. 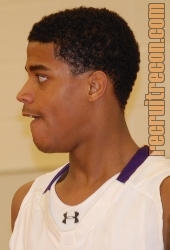 Sacred Heart and Wagner became the first division I schools to offer Broome a scholarship this summer, and although his recruitment was likely to continue growing this season at St. Thomas More, he was conscious of friends and former teammates who had bad college experiences after going to levels where they weren’t able to play immediate minutes. Verbal Commits: Imhotep forward Basil Thompson was very candid about what stood out for him at St Francis, "That no one spot is given if you come in and play better than the guy ahead of you then you will play." The 6'6 mismatch likes an up-tempo system, one where he can take advantage of his length and athleticism toward the basket. Thompson, who visited the campus for his official visit this past weekend spoke of the friendly nature of the current population, "This past weekend I went on an official visit and got a chance to meet some nice people which I liked." My Central Jersey: Union Catholic High School boys basketball standout Devine Eke has found a collegiate home just a few miles to the north. The senior-to-be committed to Fairleigh Dickinson Tuesday morning, joining first-year head coach Greg Herenda’s rebuilding project. The 6-foot-6 Eke, who plays forward in high school but projects as a wing on the next level, is known for his athleticism—in particular his jumping ability. He started at Union Catholic as a sophomore before attending St. Benedict Prep last year. His older brother, Allen, was a track and field state champion in the 800 meters at Union Catholic and now runs for Oklahoma.